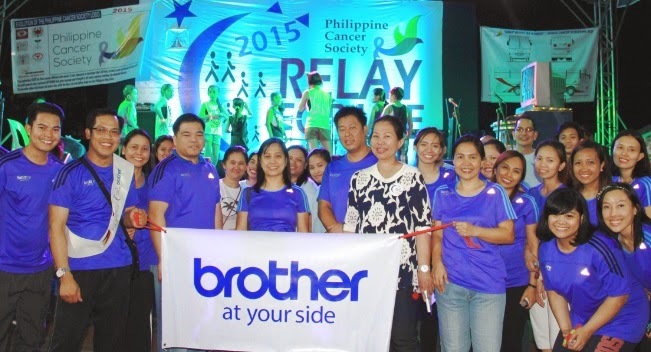 Brother Philippines continues to advocate cancer awareness by participating once more in the Relay for Life 2015 organized annually by the Philippine Cancer Society (PCS), a non-profit organization that advocates cancer prevention and control. This is the fourth consecutive year that the company became a part of Relay for Life to provide moral support to cancer patients and survivors while providing a venue for volunteerism among its employees and partners. About two-hundred employees and partners of Brother Philippines led by Brother Philippines president Glenn P. Hocson, and Deputy General Manager for Sales and Marketing Masao Kasagi walked around the Relay for Life 2015 venue around the track oval of the Amoranto Stadium in Quezon City for this year’s Relay for Life. PCS Executive Director Dr. Rachel Rosario said that the support of Brother Philippines and other private and public entities is invaluable as it tells cancer patients and survivors and their families that they are not alone. Dr. Rosario said, “The message of love from Brother and the other participants of this year’s vigil resonates and cheers on the cancer sufferers to continue the fight. They are not alone,” said Dr. Rosario. Since 2011, the Brother Group has been globally promoting participation in Relay for Life as part of social contribution activities involving employees that the Brother Group Global Charter encourages. The initiative is dubbed the “Golden Ring Project,” as different local offices of Brother that participates in Relay for Life in their respective countries form a ring around the globe. As a symbol of this global initiative, a sash embroidered with the flag of each of the participating countries using Brother’s Entrepreneur Pro PR1000e 10-needle home embroidery machine is being routed yearly where each country adds its latest year of participation in the embroidery work.